As cleansing season wraps up I wanted to share with you my thoughts on one of the questions I hear most often from folks I am supporting with their seasonal cleanse. Do I have to give up coffee? On the cleanse the answer is “yes”, post cleanse the answer is “it depends”. For about a decade I had an extremely unbalanced relationship with coffee. I relied on it heavily to pick me up not only first thing in the morning but also in the afternoon. As a result of my continually borrowing energy from external sources, I depleted my own reserves and was left feeling exhausted. I know I am not alone in my experience. If your adrenal glands are exhausted, you’ll crave coffee most likely around 3pm. Unfortunately, the energy boost you receive after drinking coffee depletes the adrenals even further. Coffee is like a metabolic credit card. Sooner or later, you have to repay the debt. Ultimately, coffee increases, anxiousness, restlessness and fatigue, especially in Vata individuals who tend to experience those qualities already. During my fall cleanse about five years ago I decided to give up coffee and although it was challenging in the beginning I am now able to honestly assess my energy levels and occasionally enjoy a cup of coffee without having to rely on it daily. Is coffee good for you? Studies show mixed results. Some studies have shown there are positive benefits from drinking an occasional cup of coffee. Coffee is known to have a warm, stimulating effect in the body. It may promote energy, stimulate digestion, and raise blood pressure. These characteristics may benefit some doshic constitutions, but are best consumed in moderation by others. Other studies show that coffee negatively affects hormones, especially female reproductive organs and hormones. Non-organic coffee is worse because it carries pesticides directly to reproductive tissue. Coffee also irritates the lining of the digestive tract and should be avoided by people with chronic digestive problems. When students/clients ask me about a specific food or drink, like, “Do I have to give up coffee?” my usual response is “that depends” followed by a number of questions regarding the time of day, how much and how often that person is consuming it. 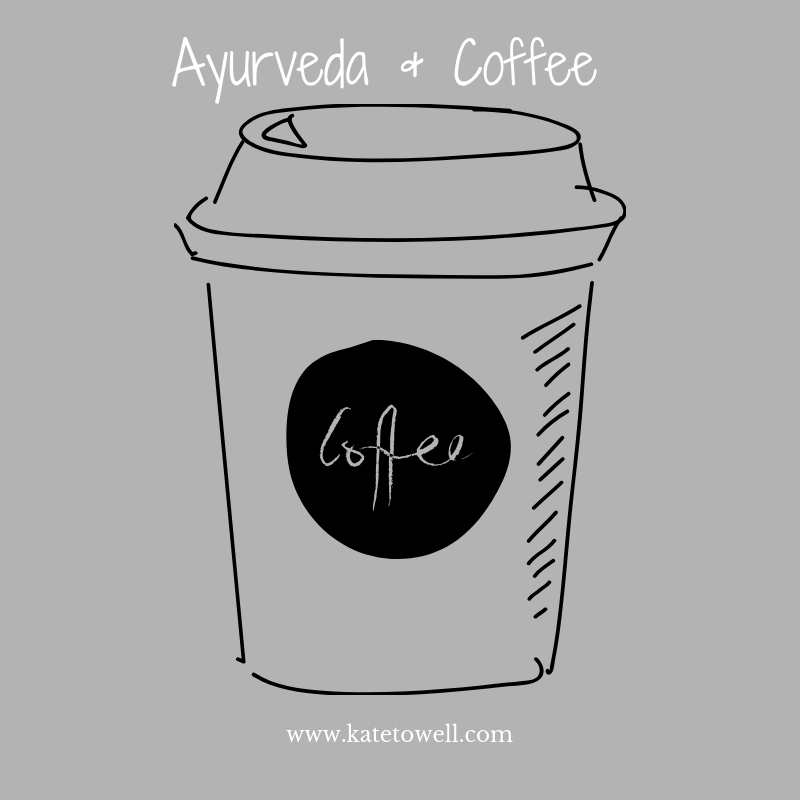 Ayurveda teaches that all plants serve a purpose and that every type of food can be a poison or a medicine, depending on what your individual constitution is—and how and when you consume it. Coffee is best viewed as a medicine. Which means it might be right for some people and not for others and it might not be right all the time. You have signs of a pitta imbalance, such as indigestion, heartburn, acid reflux, or skin rashes, or if you’re often agitated, irritated, hypercritical, judgmental, or angry. You have symptoms of excess vata, such as dehydration, dry hair, dry skin, constipation, insomnia, anxiety, restlessness, or if you feel scattered and overwhelmed. If you suffer from adrenal fatigue and chronic exhaustion. Buy good stuff—This means coffee that is organic, fair trade, and freshly roasted. Water first—Drink at least 20oz of water before you have a your morning cup of coffee. Eat something first—Start with a healthy breakfast then enjoy your coffee. Spice it up—Add cardamom to your coffee to reduce the acid effects and aid in digestion. Size matters—Limit your consumption to one cup, no more than 8oz/day. To make your cup stretch, try adding in some warm spiced milk. Timing—If your going to drink coffee enjoy between 7am and 10am. Stay mindful—Are you using coffee to generate energy in an environment where your body is naturally telling you there is none? If you notice yourself feeling low on energy take a look at your regular sleep cycles. Sometimes, the body is asking for simplicity and rest—not caffeine. Go ahead and pour yourself that daily cup of joe. Just stay mindful of its effects, and consume consciously. Don’t compromise on quality. Choose organic and limit yourself to one small cup per day.